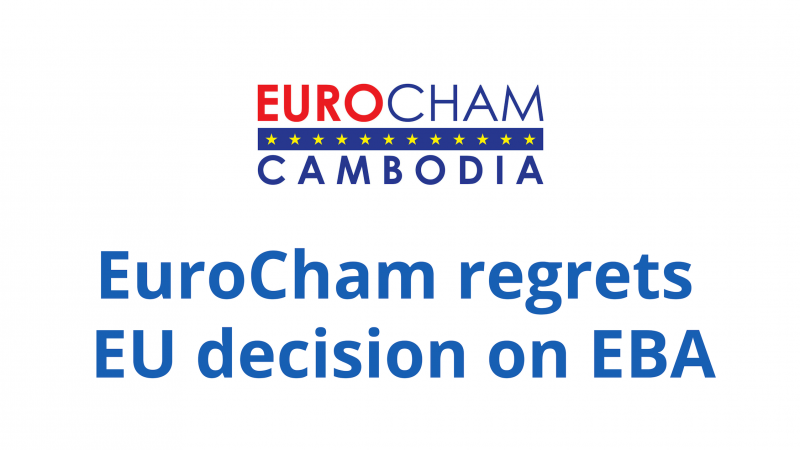 As the main representative of the large European investment and business community in Cambodia, EuroCham is deeply concerned about the possible negative consequences of this decision on current and future business between the European Union and Cambodia. The launch of EBA withdrawal investigation by the European Commission is counterproductive to Cambodia’s socio-economic transformation. This decision not only jeopardizes the past and future achievements of this partnership, but also other development initiatives funded by the European Union over the last two decades which have helped to vastly improve the socio-economic status of millions of Cambodians. We regret this decision but vow to continue partnership and engagement with the Royal Government on its business and development goals. EuroCham will closely monitor the ongoing situation and the investigation process in close collaboration with its National Chambers of France, Germany, Italy, United Kingdom, Benelux, and the Nordic countries, who share its opposition to a premature withdrawal of the preferences 7 years ahead of the original withdrawal date in 2027. Please click the icon below to download the Press Release. We thank you for your attention! Event Recap: Breakfast Talk on "Food Safety"